Welcome once again, Gameologerinos, to our weekend thread for the disclosure of gaming plans and general merriment. We implore you, as always, to tell us all about what you’ll be playing this weekend down in the comments. As for me, I’ve been dipping my toes into a couple of games over the last few weeks. As badly as I’d like to, I’ve been too busy to get back into Dragon Age: Inquisition. Lately, I’ve been turning to the recently released Pokémon: Alpha Sapphire to unwind. I love the Pokémon games—and similar light role-playing games—for quick breaks from work or playing while I watch some mindless TV when I really want to veg out. They’re simple and repetitive enough that I can just turn my brain off, running through tall grass and squashing any puny rival trainers that get in my way. Facilitating that mindlessness are the little conveniences Nintendo added to these full 3DS overhauls of Sapphire and Ruby, its Game Boy Advance Pokémon entries. 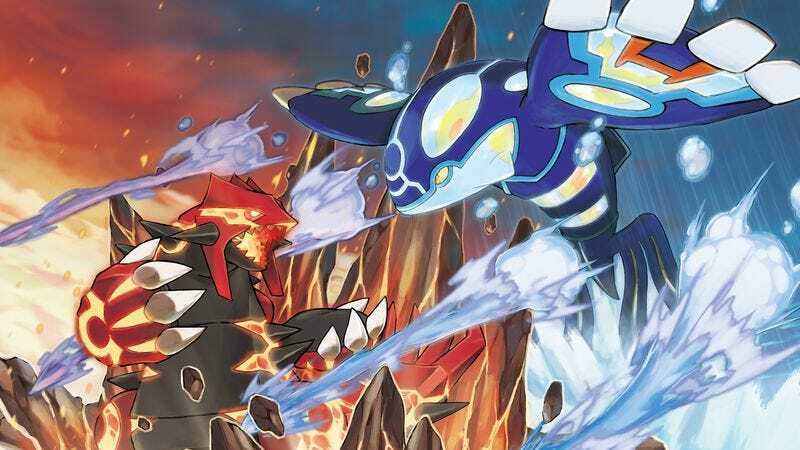 It has taken the world, critters, and events of those past games, and refitted them with the bells and whistles of last year’s Pokemon X and Y. Ultimately, those games weren’t successful because they told a good story or had more memorable monsters (I’d say they didn’t do either of those things well), but because they took a tried and true formula and fully modernized it. They, and in turn Omega Ruby and Alpha Sapphire, were slick, aerodynamic Pokémon games tuned for modern players. Swapping pocket monsters in and out of your team at a computer is simple when you can drag and drop them on the touch screen. Trading and battling online is a breeze (once you get past Nintendo’s archaic “friend code” nonsense). Once you get the Exp. Share item, every pokémon on your team benefits from a fight, not just the ones that go to battle, meaning there’s less micro-management to be done as one monster gets way buffer than the rest. Now, your trainer even has a gizmo that’ll tell them if they’ve caught every pokémon in a given area. It’s seriously handy. On the other hand, I can’t help but be annoyed by Alpha Sapphire’s insistence that I pay attention to its joke of a storyline. I don’t care about these environmental-terrorist pirates and their plot to awaken some terribly powerful beast (or whatever). I just want to catch some of them and be the very best, damn it. Quibbles aside, though, Alpha Sapphire is the kind of remake I can get behind. I can take or leave the new 3-D world (leave, if I’m being honest), but it’s nice to have an old game’s dated edges smoothed out in a way that doesn’t rob it of anything.